If you are looking for a homemade veggie burger recipe, this recipe is full of flavor! What is great about it too, the base of the burger is sweet potato, rice, beans, and pecans can then be spiced up to your preference. Instead of the cumin you could use onion powder and garlic powder, or even try an Indian-style veggies burger with curry powder! The only trick to making the burgers is to press the mixture firmly together when forming them into patties, as the mixture will be a little sticky. Then during cooking, when you go to flip them half-way through, press them gently with a metal spatula before flipping and it helps them stay together. As a side note, the homemade pickled onions are a great addition as well and are quick and easy to make! 2. Add the black beans to a large mixing bowl and mash. Then add remaining ingredients and mix well. 3. Use 1/3 cup of the burger mixture to hand form patties. Place on a parchment lined baking sheet. 4. Bake for 35 - 40 minutes, flipping carefully half way through. 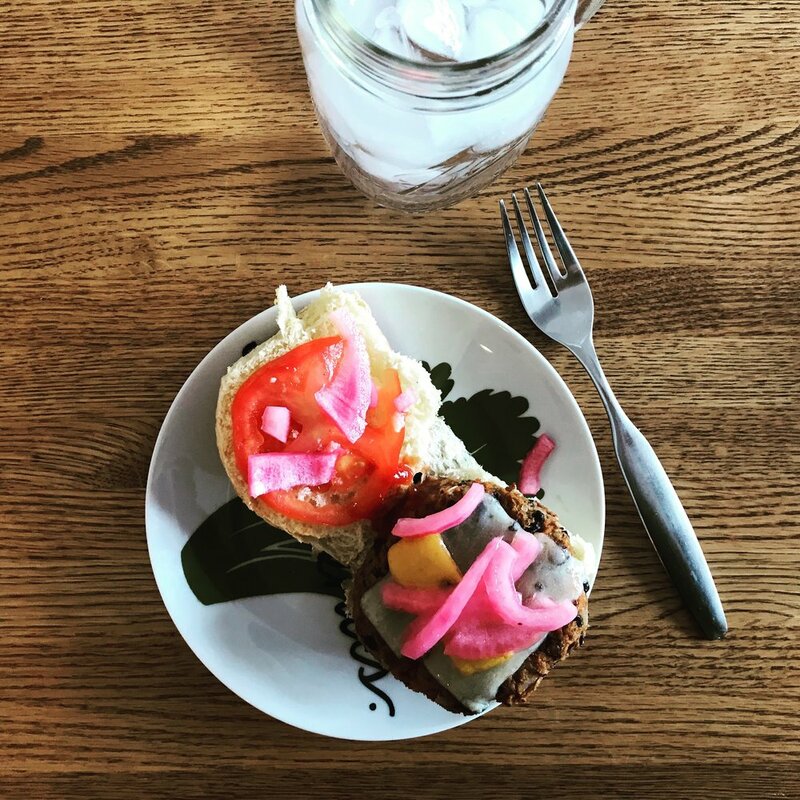 Serving suggestion: Serve on mini rolls topped with sliced tomato and pickled red onions (As pictured above)! Other topping ideas: sliced avocado, lettuce, fried egg, cheese, Dijon mustard, etc. 1. In a small sauce pan combine the vinegar, sugar, salt, and pepper. Whisk to combine and bring the mixture to a boil. 2. Place the sliced onion in a glass container and top with the boiling mixture. Cover and refrigerate. Let the onions marinade for at least 20 - 30 minutes.